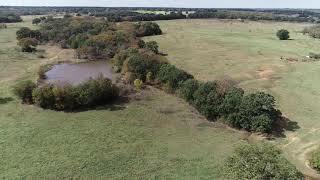 Combination recreational and grazing property with huge hardwoods, good grasses and plenty of surface water. Sandy soils, improved and native grasses, 2 seasonal creeks and 4 ponds. Fenced and cross-fenced with working pens. Over 70 ft of elevation change. Awesome hunting including dove, ducks, hogs, turkey, and whitetail. From Peoria, go west on Hwy 22 for 1.5 miles. Turn right onto FM 3050 and go 2.6 miles to HCR 1256. Turn left onto HCR 1256 and go 3/4 of a mile. Property starts on your left.